GET A TOP BANNER AD ON OUR HIGH TRAFFIC ROTATOR, NOW GETTING OVER 100K VISITORS PER DAY! Very Limited spots available, so order today! 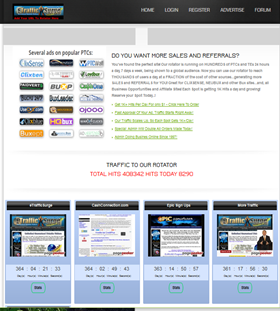 If You're looking for more referrals, signups and sales...You've come to the right site. You can now GET YOUR AD AT THE TOP OF OUR HIGH TRAFFIC ROTATOR, now getting over 100K visitors a day! 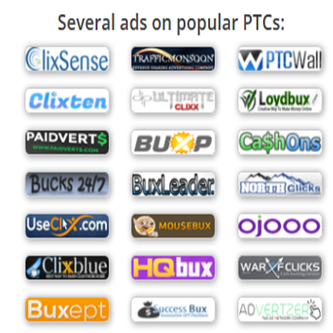 We have ads on over 400 Traffic Exchanges and PTC sites. 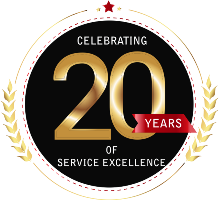 Our eTrafficSurge Rotator will ROTATE Your BANNER ad at the top of our page that's on hundreds of PTCs and TEs, 24 hours a day, 7 days a week, being shown to a global audience. Your advertising can reach thousands of users every day, at a fraction of the cost of other sources, generating more sales and more referrals! Yes, you'll get signups for Clixsense, Neubux & other Bux Sites...And, all affiliate and Business Opportunity sites, too!! BANNER SPOTS ARE VERY LIMITED IN THE ROTATOR, SO PLEASE ORDER SOON...BEFORE ALL ARE TAKEN!. are getting about 100K impressions per day and growing. After you place your order, you will receive an email with login info. Each Rotator TOP BANNER Spot Gets 100K+ Impressions/Day! the Rotator Login and stats tracking info.